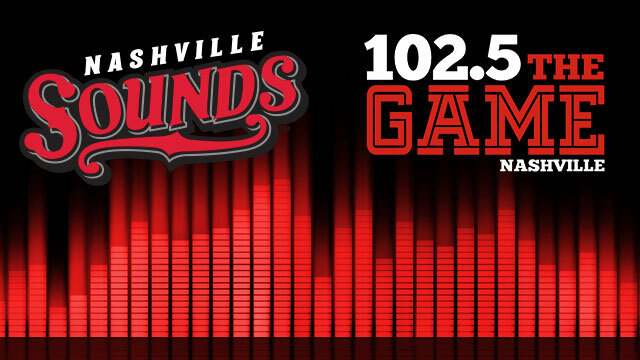 Sounds Extend Partnership With "The Game"
NASHVILLE, Tenn. - The Nashville Sounds Baseball Club is excited to announce an extension of its partnership with 102.5 "The Game" (WPRT-FM) as the team's flagship station for game broadcasts during the 2015 season. The Game, which has served as the team's flagship station since 2012, will air all of the Sounds' 144 games over the airwaves with nearly all on 102.5 FM and select games on 94.9 FM "Game 2" in 2015. "We are pleased to continue our relationship with The Game," said Sounds COO Garry Arthur. "It is important to us to align with a partner who shares our excitement for the opening of First Tennessee Park and can carry all of the games on a station that focuses on sports programming." "We are thrilled to continue broadcasting the Sounds games on our stations. We've seen the excitement First Tennessee Park has generated for the Nashville community and as a local business, we're proud to be involved," said Jana Hampton, general manager of 102.5 The Game. Sounds broadcasts which will be pre-empted from 102.5 FM and will instead air on 94.9 FM include: April 9, April 11, and any Nashville Predators playoff games that conflict with the Sounds' schedule. All game broadcasts will also be available to Sounds fans via a live internet webcast based at www.nashvillesounds.com as well as on mobile devices using The Game's app or the TunedIn Radio app. Jeff Hem, the "Voice of the Sounds," will be behind the microphone for all broadcasts during his fourth season in the Music City. Broadcasts will begin approximately 15 minutes prior to game time and will include a postgame show. The Sounds enter their first season as the Oakland Athletics' Triple-A affiliate in 2015. The partnership will also include the annual broadcast of the Triple-A All-Star Game, which is slated for July 15 in Omaha, Nebraska. 102.5 The Game's baseball coverage also includes broadcasts of ESPN's "Sunday Night Baseball" when there isn't a conflict with a Sounds broadcast. The station also serves as the flagship station for the NHL's Nashville Predators and airs Middle Tennessee State University football and men's basketball games, and is simulcast on 97.5 FM in Rutherford County. The Sounds kick off their 2015 season with an April 9th road contest in Colorado Springs and will host 72 home games at brand-new First Tennessee Park in 2015, beginning with the 7:05 p.m. home opener against Colorado Springs on Friday, April 17th. Please visit www.nashvillesounds.com for a game schedule and complete information on ticket packages for the inaugural season at First Tennessee Park.